July 31, 2018 • Allison M. Hermann, Ph.D. According to a radical new model of emotion in the brain, a current treatment for the most common mental health problems could be ineffective or even detrimental to about 50 percent of the population. Since the 1970s, hundreds of studies have suggested that each hemisphere of the brain is home to a specific type of emotion. The neural system for emotions linked to approaching and engaging with the world – like happiness, pride and anger – lives in the left side of the brain, while emotions associated with avoidance – like disgust and fear – are housed in the right. Daniel Casasanto, associate professor of human development and of psychology, adjusts electrodes on the scalp of a study participant. But those studies were done almost exclusively on right-handed people. That simple fact has given us a skewed understanding of how emotion works in the brain, according to Daniel Casasanto, associate professor of human development and of psychology. 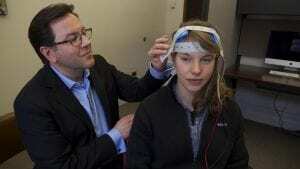 That long-standing model is, in fact, reversed in left-handed people, whose emotions like alertness and determination are housed in the right side of their brains, Casasanto suggests in a new study. Even more radical: The location of a person’s neural systems for emotion depends on whether they are left-handed, right-handed or somewhere in between, the research shows. The study, “Approach motivation in human cerebral cortex,” appeared June 18 in Philosophical Transactions of the Royal Society B: Biological Sciences. The paper’s first author, Geoffrey Brookshire, was a doctoral candidate in Casasanto’s lab at the University of Chicago and a visiting doctoral student in Casasanto’s lab at Cornell. The idea for the researchers’ theory, called the “sword and shield” hypothesis, stems from Casasanto’s observation that we use our dominant hands for approach-oriented actions, while nondominant hands are used for avoidance movements. The researchers theorized that approach and avoidance emotions are built on neural systems for approach and avoidance actions. Casasanto and Brookshire tested this idea by stimulating the two hemispheres of the brains of 25 healthy participants with a pain-free electrical current. The goal was to see if they could cause the participants to experience approach-related emotions – including enthusiasm, interest, strength, excitement, determination and alertness – depending on which hemisphere of the brain was stimulated and whether they were righties or lefties or somewhere in between. The study participants got zapped for 20 minutes a day for five days, and reported before and after the five days how strongly they were feeling emotions like pride and happiness. The experiment worked – and corroborated the researchers’ first test of the sword and shield hypothesis using brain imaging. Strong righties who were zapped in the left hemisphere experienced a boost in positive emotions. So did strong lefties zapped in the right hemisphere. But when lefties are zapped in the left hemisphere – or righties in the right – “you see either no change or a detriment in the experience of these emotions,” Casasanto said. The work has implications for a current treatment for recalcitrant anxiety and depression called neural therapy. Similar to the technique used in the study and approved by the Food and Drug Administration, it involves a mild electrical stimulation or a magnetic stimulation to the left side of the brain, to encourage approach-related emotions. But Casasanto’s work suggests the treatment could be damaging for left-handed patients. Stimulation on the left would decrease life-affirming approach emotions. “If you give left-handers the standard treatment, you’re probably going to make them worse,” Casasanto said. “And because many people are neither strongly right- nor left-handed, the stimulation won’t make any difference for them, because their approach emotions are distributed across both hemispheres,” he said. However, Casasanto cautions that this research studied only healthy participants and more work is needed to extend these findings to a clinical setting. The research was funded by a James S. McDonnell Foundation Scholar Award and the National Science Foundation. Posted in Features and tagged brain, College of Human Ecology, Daniel Casasanto, emotion, human development, human neuroscience, psychology on July 31, 2018 by Allison M. Hermann, Ph.D..